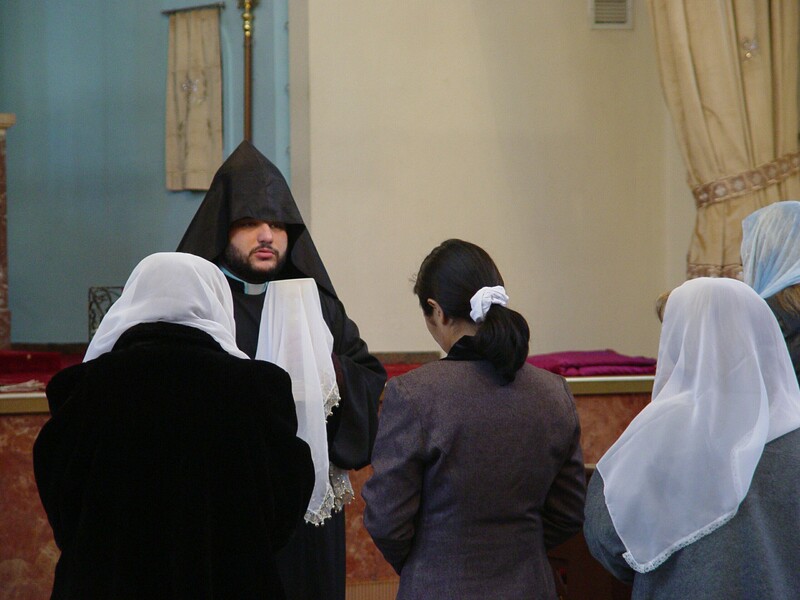 A great annual Armenian spiritual journey began this week, the one that leads to the solemn penitential season of Lent, and finally to the events of Holy Week and Easter. Last week was Arachavorats Sunday, the equivalent of the western Septuagesima (cf. Anglican Book of Common Prayer). But for the Orthodox “septuagesima” really means 70 days, in keeping with the custom of the early church, and the journey to Easter begins 10 full weeks (not 9 weeks as in the west) before the great day. 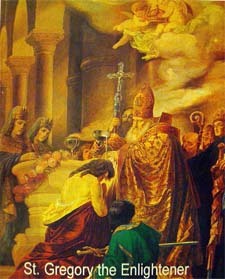 The story of the conversion of Armenian begins, in 287 AD, with King Tiridates III punishing St. Gregory the Illuminator for refusing to worship the heathen god Anahit. The punishment begins with a series of 12 terrible tortures which Gregory miraculously survives, earning him the title of “living martyr”. Finally, exasperated by Gregory’s endurance and further enraged by accusations that Gregory is the son of the man who assassinated the king’s father, Tiridates has Gregory thrown into the deep pit of Khor Virab prison. Fourteen year’s later, St. Gregory is finally freed from the pit and welcomed as a man of God by is persecutor Tiridates — whose heart has finally been opened to hear the Gospel. When St. Gregory the Illuminator, emerges from the dark pit, he evokes the mission of Jonah to Nineveh and orders all of the people to observe a strict penitential fast for five days, and in this way to prepare to receive the Gospel message and baptism in the Christian faith. For Armenians today, the combination of the Orthodox Fast of the Catechumens and the commemoration of St. Gregory’s emergence from the pit results in three days of fasting: Monday to Wednesday in this week following Arachavorats Sunday. For adult men, this is the standard Orthodox fast: abstinence from eating any animal product (no meat, dairy products, eggs — fish, not considered animal, is allowed.) For adult Armenian women, however, it is another story. 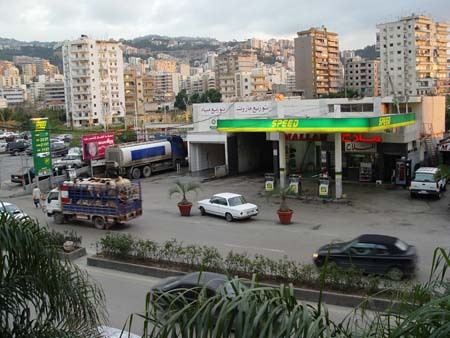 Those who are able undertake a severe or complete fast that ends with special prayers, at dawn on Wednesday morning. This Wednesday a rather large crowd, for the most part women, join us for morning prayers in the Cathedral. 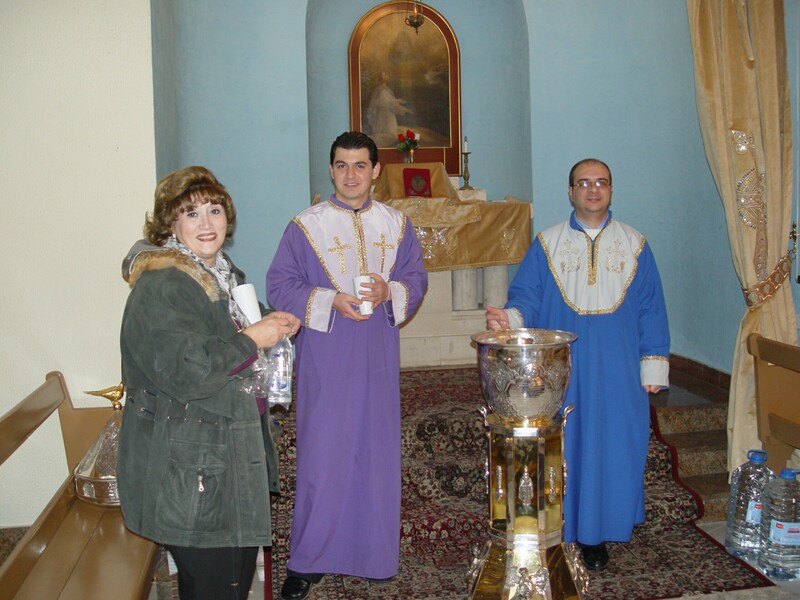 Following the usual prayers of the day, there is a penitential rite (general confession is the norm for the Armenian Orthodox) followed by communion from the sacrament reserved for this express purpose from the Arachavorats Sunday Divine Liturgy. 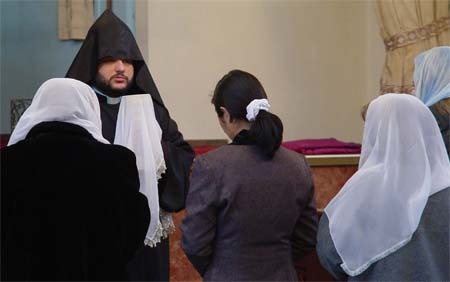 Father Ananya, wearing the traditional hood of the celibate Aremenian priest, is pictured here preparing to administer the sacrament. In a side chapel, Father Norayr presides over the blessing of water contained in a large silver and polished brass container. The Gospel is read telling the story of the Samaritan woman who meets Jesus at the well, and the words of Jesus, “Those who drink of the water that I will give them will never be thirsty. The water that I will give will become in them a spring of water gushing up to eternal life.” (John 4.14) The faithful come forward for a cup of the blessed water, officially ending the fast. 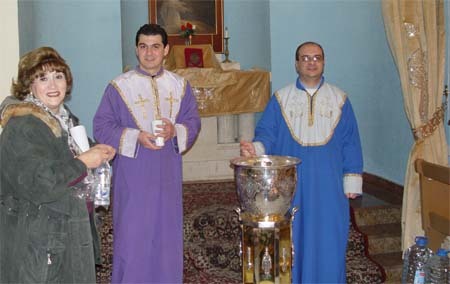 Pictured here, two of the Cathedral acolytes, Harout and Hirayr, candidates for ordination to the married priesthood, both from centuries old Armenian communities in Syria. Recieving water from them, a woman from the local Armenian community. Many continue on to the large dinning hall beside the smaller refectory where the monks have their meals. There is a special festive break-fast prepared for the women. My “angel” Mariette (see earlier posting) brings me a sample: a special bread, fried flat and flavoured with sugar and cinnamon.